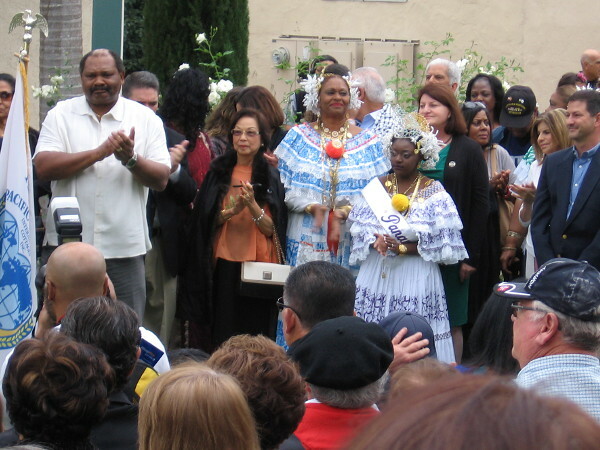 Groundbreaking at Balboa Park’s International Cottages! – Cool San Diego Sights! 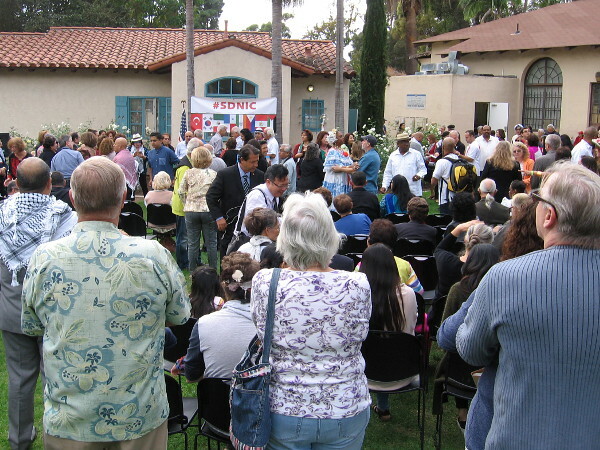 Groundbreaking at Balboa Park’s International Cottages! 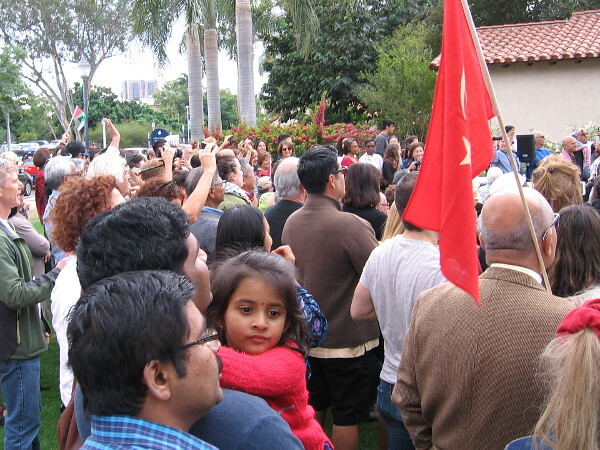 San Diego residents with diverse backgrounds gather for an important groundbreaking in Balboa Park. Five new cottages will be the home of nine nations at the House of Pacific Relations International Cottages. Today was an exciting day in Balboa Park! 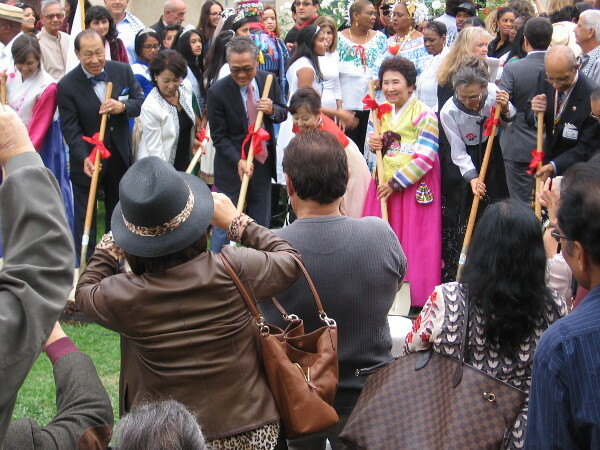 A groundbreaking ceremony was held at the House of Pacific Relations International Cottages, where nine member nations look forward to eventually moving into five brand new cottages! Because there is limited space in this particular area of Balboa Park, four of the cottages will be duplexes shared by eight nations; the fifth will be home to the House of the Philippines. Colorfully dressed representatives from the Philippines, Peru, Mexico, India, Lebanon, Turkey, Panama, Korea and Palestine (not presently a nation, but a culture) participated in the groundbreaking. If all goes according to plan, they’ll have their cottages completed by the end of 2017, just in time for December Nights! As many in San Diego know, several changes and improvements are coming to Balboa Park, including an underground parking garage behind the Spreckels Organ Pavilion, a very short distance from the cottages. 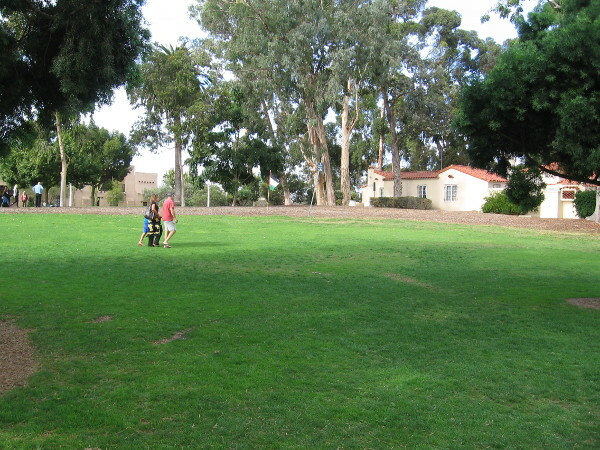 A huge parking lot near the center of Balboa Park will be replaced with grass, gardens, walkways and more beautiful park! Following all of this construction should be quite interesting! Stay tuned! 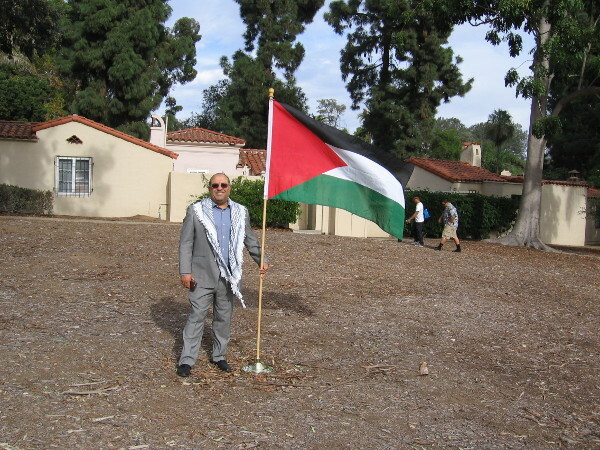 A friendly gentleman from the House of Palestine stands near a flag where a new cottage will be built that showcases Palestinian culture. Three duplex cottages will be built in this area south of the existing cottages, directly behind the House of Ukraine and House of the United States. 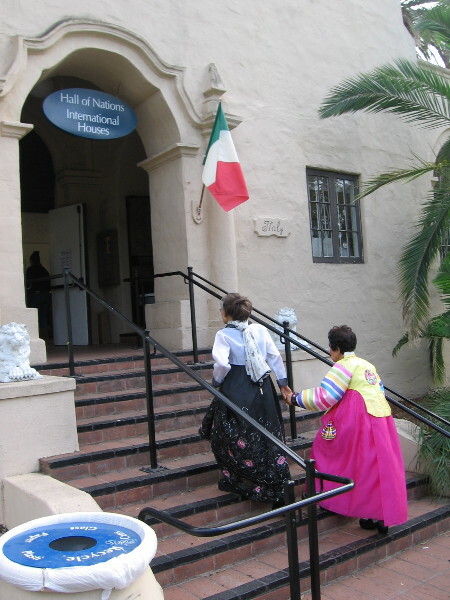 Two ladies in colorful dress enter the Hall of Nations Building for a special groundbreaking reception. The Hall of Nations Building has been used on a rotating basis by member nations who don’t presently have a cottage. 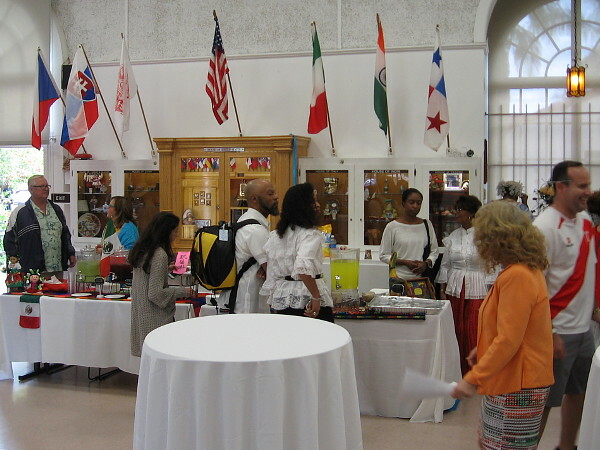 Today a reception was held inside celebrating the groundbreaking of five new international cottages. Two cottages will be built in this area, north of the House of Iran and the Hall of Nations Building. 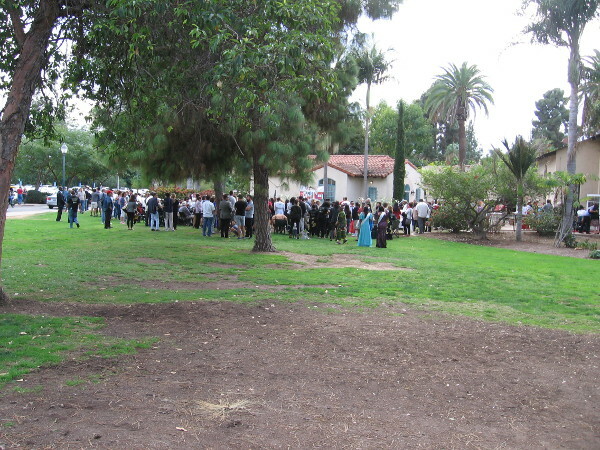 In this photo a crowd is gathering for the historic groundbreaking ceremony. The original House of Pacific Relations cottages were built in 1935 for the California Pacific International Exposition in Balboa Park. Pacific means peaceful, and that is the intent of the cottages–to promote friendship between nations and mutual understanding. 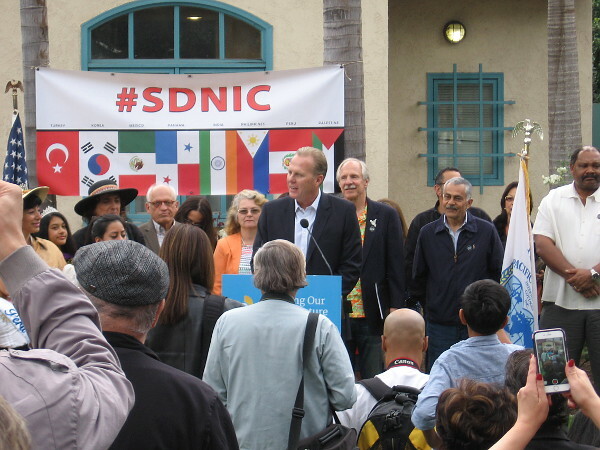 San Diego Mayor Kevin Faulconer addresses those attending the long-awaited groundbreaking. Many dignitaries spoke, and those who’ve been working tirelessly to complete the expansion were honored. Beauty queens from the House of Panama stood proudly with others near the podium. The nine member nations who will be receiving new cottages all participated in the traditional groundbreaking ceremony. Lifting these shovels are representatives from the House of Korea. Previous Previous post: A turkey is discovered lurking in San Diego! Next Next post: Last chance to enjoy Anthony’s at the waterfront.